Abraham Simon Wolf Rosenbach got his start collecting while a freshman in college at the University of Pennsylvania. 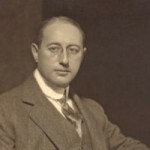 He also worked for private clients such as J. P. Morgan, Lessing Rosenwald, and Harry Elkins Widener. He published several articles and even books in order to reinforce the interest in rare books and manuscripts. Rosenbach is credited with popularizing the collecting of American literature at a time when only European literature was considered collectable. He also advanced the idea of book collecting as a means of investment. Dr. A.S.W. Rosenbach died, aged 75, in Philadelphia. His legacy is the Rosenbach Museum & Library. On April 2, 2008, the Rosenbach Museum & Library received an official State Historical Marker by the Pennsylvania Historical and Museum Commission in recognition of the lasting contributions of museum co-founder, Dr. A.S.W. Rosenbach.